Rinnai hot water heater leaking? Want to upgrade to a Rinnai Instantaneous/Continuous flow hot water system? Based in Nagoya Japan, Rinnai are the world’s largest gas appliance manufacturer in the world. The company was established in 1920. Rinnai has been and continues to be at the forefront of quality in gas products. For example, Rinnai are the original manufacturers of the tankless water heater. In 1991 Rinnai entered the hot water systems market at their grand opening at Pier One Darling Harbour in Australia. Since day one, Same Day Hot Water has been there installing and servicing Rinnai hot water heaters. Through this experience we have become leaders in our field for working with Rinnai units. Even other plumbers enlist our advice or enlist our services to work on their behalf for getting their clients Rinnai hot water system back into hot water. If you are having problems with your Rinnai unit or simply want to upgrade to an instantaneous/continuous flow system you have come to the right place. Call 1300721558 for us to get your Rinnai hot water heater back up and running. All Rinnai hot water systems feature quality Japanese design with manufacturing in Rinnai’s own high tech facility. Since Rinnai owns the whole manufacturing process, they make all of the components of their systems. These components are specifically designed for Rinnai hot water systems and are always top quality. Infinity Touch 26 unit with wireless controller. The Rinnai Infinity 26 Touch has a 26 litre flow rate per minute at a 25°C rise. This is the latest product Rinnai has put on the market. Its innovative design allows for convenience of temperature control a cut above the rest. The wireless temperature control not only makes things easy, but it also keeps things safe for hot water temperature. Since it is a continuous flow unit the hot water never comes out. Additionally, since it is a continuous system it is only heating the water you use. This means it saves money as you are not paying to heat water to store for later that you may not use. This is a high efficiency system with a star energy rating of 6.1 stars. Interested in the Infinity Touch 26 for your home? The Rinnai Infinity continuous flow units comes in capacities of 16L, 20L, 26L and 32L that fit perfectly when limited space is available. These are the original Rinnai heaters and are the most efficient, have the lowest flow rate while still providing the right temperature, and the longest warranty. Not to mention, they are easy to install, the only wireless controller on the market, and are popular with consumers as over 1.5 units are sold worldwide each year. Due to endless hot water and added safety controllers these units are compatible with big families, families with young children, and spas. Call us today to have your Rinnai installed. These systems are the most efficient with high star energy ratings. To make the most out of your continuous flow unit, Rinnai recommends a water controller. There are many purposes of the water controller. It minimizes temperature fluctuations, increases hot water safety, and extends the warranty. Additionally, it is user friendly due to its ease of use. They are available in universal, deluxe, or wireless options. As its name suggests, the Rinnai Builders Series primary use is for new homes and projects. These units are available in dune colour in 16 litre, 20 litre, and 26 litre capacities for external installation. Rinnai B16, Rinnai B20, and Rinnai B26 all have a 6 star energy efficiency. Rinnai manufacturers Hotflo gas units in both medium and large capacity models with at least a 4 star rating efficiency. This range of units is intended to be a quick and easy replacement for an existing 3 or 4 star rating efficiency hot water system. Furthermore, Hotflo gas units are mains pressure units so there is no compromise on pressure when using multiple taps simultaneously. The Hotflo 135 litre gas storage tank hot water system is made of a vitreous enamel lined steel tank for durability. Additionally, inbuilt anode (hyperlink to anode in blog) protection extends the life of the tank. This medium capacity model is designed for external use only and is available in natural gas. Hotflo 135 litre system has a 4.7 star energy rating. The Hotflo 170 litre gas storage tank hot water system is made of a vitreous enamel lined steel tank for durability. Additionally, inbuilt anode (hyperlink to anode in blog) protection extends the life of the tank. This large capacity model is designed for external use only and is available in natural gas. Hotflo 170 litre system has a 4 star energy rating. Interested in a Rinnai Hotflo gas storage hot water system for your home? Rinnai offers a selection of small, medium, and large capacity electric hot water systems in Flowmaster or Hotflo models. The 25 litre and 50 litre models are ideal for installation under benches, in cupboards, or other internal areas with small spaces. The storage cylinders are vitreous enamel lined steel tanks which creates durability. Additionally, these systems have inbuilt anode protection which extends product life of the tank. The 80, 125 litre and 160 litre models are ideal for medium sized families. These systems have the option of internal or external installation. The storage cylinders are vitreous enamel lined steel tanks which createsdurability. Additionally, these systems have inbuilt anode protection which extends product life of the tank. The 250 litre, 315 litre, and 400 litre models are ideal for big families as there is no compromise in pressure. These systems have the option of internal or external installation. The storage cylinders are vitreous enamel lined steel tanks which creates durability. Additionally, these systems have inbuilt anode protection which extends product life of the tank. The 25 litre and 50 litre models are ideal for installation under benches, in cupboards, or other internal areas with small spaces. The storage cylinders are vitreous enamel lined steel tanks which creates durability. Additionally, these systems have inbuilt anode protection which extends product life of the tank. As a bonus, the units have the option of a plug. The 80, 125 litre and 160 litre models are ideal for medium sized families. In the 160 litre model you have the option of a single and twin element. These systems have the option of internal or external installation. The storage cylinder is a vitreous enamel lined steel tanks which creates durability. Additionally, these systems have inbuilt anode protection which extends product life of the tank. The 250 litre, 315 litre, and 400 litre models are ideal for big families as there is no compromise in pressure. All models have the option for single and twin elements and have the option of internal or external installation. The storage cylinders are vitreous enamel lined steel tanks which creates durability. Additionally, these systems have inbuilt anode protection which extends product life of the tank. Harness the power of the sun to produce hot water for your home. 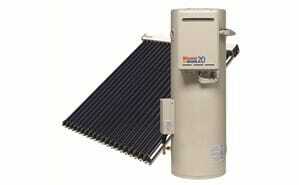 These are the top of the line solar hot water systems from Rinnai. Rinnai refers to this range of units as the “Rolls Royce of solar hot water systems.” This is based on the innovative design coupled with the high quality of 444 grade stainless steel tanks. All of the storage tanks in this series are made right here in Australia. Since this system uses the sun’s energy it is environmentally friendly and saves you money. By replacing an electric hot water system with a Rinnai Prestige Solar hot water system can reduce electricity consumption and running cost by 2/3. This previous statistic is based on a close coupled 330 litre stainless steel electric boosted solar hot water tank with 2 solar panel collectors with medium to large hot water load. In a closed couple system both the storage tank and the solar collector panels are linked together and mounted on the roof. The close coupled systems of the Prestige Solar series are available in numerous Colorbond® colours of 444 grade stainless steel in 180 litre and 330 litre capacities. Additionally, there is the option for electric or dedicated continuous flow gas boost configurations. A frost tolerant version (FTC) to withstand temperatures down to minus 6 degree Celsius is available. Worried about parts that may break down? Well this Prestige system has no moving parts and no sacrificial anode. In a flat plate system, there are parts of the hot water system on both the ground and roof. The storage tank is installed on the ground and the flat solar collector panels are installed on the roof. A small pump is needed to circulate the water from the storage tank through the solar panel collectors to absorb the sun’s rays. The flat plate systems of the Prestige Solar series are available in 250 litre and 330 litre capacities. Additionally, there is the option for electric or dedicated continuous flow gas boost configurations. A frost tolerant version (FTC) to withstand temperatures down to minus 6 degree Celsius is available. There is no need to reinforce the roof structure and there is minimal visual impact on the roof. In an evacuated tube system, there are parts of the hot water system on both the ground and roof. The storage tank is installed on the ground and the evacuated tube solar collector panels are installed on the roof. A small pump is needed to circulate the water from the storage tank through the solar panel collectors to absorb the sun’s rays. The evacuated tube systems of the Prestige Solar series are available in in 250 litre and 315 litre capacities with evacuated tube solar collector panels in 20, 25, or 30 configurations. Additionally, there is the option for electric or dedicated continuous flow gas boost configurations. The system is frost tolerate to withstand temperatures down to minus 12 degree Celsius. There is no need to reinforce the roof structure and there is minimal visual impact on the roof. The key difference between the Prestige and Sunmaster solar hot water systems is the composition material of the storage tank. As previously described, the Prestige range is a high grade stainless steel. Whereas the tank in the Sunmaster range is made of vitreous enamel with a glass lining. The solar collector panels in the Sunmaster range are made in Australia. In a closed couple system both the storage tank and the solar collector panels are linked together and mounted on the roof. These vitreous enamel glass lined storage tank are available in 200 or 300 litre capacities with electric or continuous flow gas boost. A frost tolerant version (FTC) to withstand temperatures down to minus 6 degree Celsius is available. Worried about parts that may break down? Well this Sunmaster system has no moving parts or pumps. For added protection, a sacrificial anode is inside the tank. In a flat plate system, there are parts of the hot water system on both the ground and roof. The storage tank is installed on the ground and the flat solar collector panels are installed on the roof. A small pump, as part of the solar control unit, is needed to circulate the water from the storage tank through the solar panel collectors to absorb the sun’s rays. The flat plate systems of the Prestige Solar series are available in different capacities of 175 litre, 215 litre, 250 litre, 270 litre, and 315 litres. Additionally, there is the option for electric or dedicated continuous flow gas boost configurations. A frost tolerant version (FTC) to withstand temperatures down to minus 6 degree Celsius is available. There is no need to reinforce the roof structure and there is minimal visual impact on the roof. For added protection, a sacrificial anode is inside the tank. In an evacuated tube system, there are parts of the hot water system on both the ground and roof. The storage tank is installed on the ground and the evacuated tube solar collector panels are installed on the roof. A solar control unit allows for the circulation of water between the tank and header across the top of the tubes. The evacuated tube systems of the Sunmaster series are available in different capacities of 175 litre, 215 litre, 250 litre, 270 litre, and 315 litres with evacuated tube solar collector panels in 20, 25, or 30 configurations. Additionally, there is the option for electric or dedicated continuous flow gas boost configurations. The system is frost tolerate to withstand temperatures down to minus 12 degree Celsius. There is no need to reinforce the roof structure and there is minimal visual impact on the roof. For added protection, a sacrificial anode is inside the tank. The Rinnai Commercial Hot Water Systems are designed for commercial use with both internal and external units available. Some types of hot water systems offered include instantaneous/continuous models, hot water storage tanks, and warm water valves. Businesses these hot water systems would be ideal for include: small cafes, child care centres, small retail businesses, hair salons, caravan parks, laundromats with domestic style top loader machines, and butchers. The Rinnai Heavy Duty Range are designed for commercial use with internal and external units available. These are continuous flow units that offer constant outlet temperature with thermal efficiency. The systems have a high thermal efficiency with star energy ratings of at least 5.9. This is due to the systems only using gas when they are in operation. The most popular model is the HD200e. HDC211 models uses condensing technology to heat the water. The condensing technology incorporates 2 state of the art heat exchangers to achieve the ideal heating value from each mega joule of either natural gas (NG) or propane. The HD250e is the largest model in the Heavy Duty Commercial range and is still highly efficient with a star energy rating on 5.9. The Rinnai Demand Duo model links six of the heavy duty continuous flow heaters to a heavily insulated stainless steel storage tank. The purpose of this design is to allow for short periods of peak hot water use. Therefore achieving a greater amount of hot water at that time than each individual heater can produce on its own. Since it is based on short periods of peak hot water use, this commercial hot water system is best suited for situations when there is a predictable volume of hot water consumption. Consequently, this system is ideal for hotels, motels, apartment blocks, student accommodation, shower blocks, and commercial kitchens and laundries. The Rinnai Demand Duo Warm Water Valve is a warm water valve built to accept incoming hot water (60 degrees Celsius or more) from a hot water storage system and then deliver a reduced constant outlet temperature across a full range of flow rates with minimal pressure drop. The ideal situations for Rinnai Warm Water Valve system are large apartment blocks, large hotels, hospitals, nursing homes, and aged care facilities.